At the very edge of the falls your knees feel a little weak. There is nothing like hearing the giggles of your children as a beautiful butterfly lands on their shirt. There is also nothing like being on a boat at the bottom of Horseshoe Falls on a hot summers day. The power of the falls is intimidating but you feel perfectly safe. The cool mist covers your family from head to toe and everyone is smiling. That sounds like a perfect family trip to me. A few weeks ago I was invited by Niagara Parks to try out their adventure pass at Niagara Falls with my family. On top of it saving you money, it includes four adventurous activities, a bus pass for two days to get you to wherever you needed to go, and some coupons to save you even more money. Whichever activity you choose, make sure you bring good company to share in these memories, you wouldn't want to do it alone (or maybe you would... I am not judging). 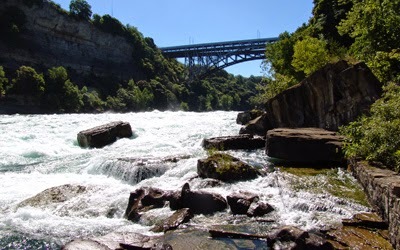 So without any more hesitation here is my list of the Top Five Family Things to Do in Niagara Falls. Take a walk along a boardwalk at the edge of one of the world's wildest stretches of whitewater. Trillions of gallons of water are forced into this accelerating trough with three to five-metre (10 to 16 ft.) standing waves. Tip: Just a heads up, this one is a few kilometres away from the falls. The Butterfly Conservatory is located on the grounds of the Niagara Parks Botanical Gardens, 10 minutes north of the falls. Over 2,000 butterflies, made up of 45 different species, call this beautiful space home. Explore and be amazed at all of the different colors and if you are lucky one might even land on you! Tip: This is not part of the Adventure Pass but is a great way to spend a couple of hours with your loved ones. Wear anything green and the butterflies are more likely to land on you! This is also near the White Water Walk. This attraction brought out a lot of smiles from my family. Discover the ancient story of Niagara Falls in a fun animated tale that the whole family will love. Follow it up with a thrilling 4D experience that takes you back 10,000 years to when Niagara Falls was formed. Tip: You will get wet and it is dark and very loud. You'll travel down into the tunnels behind the thundering Horseshoe Falls, where lookout holes give you a backstage pass to this incredible wonder. Then, step out onto the observation deck and experience the falls crashing down from 13 stories above. As you marvel at the huge waterfalls the mist covers your face and makes you feel alive (and cool on a hot day). Tip: Journey Behind the Falls is in the same building as Niagara's Fury, be sure to book the times close together. My daughters get up close to the falls, they loved this attraction! This is my favourite adventure of all. What a thrilling way to experience Niagara Falls. This up close and personal tour of the falls get you as close as possible to the breathtaking power and mist that is the magnificent Niagara Falls. Hornblower Niagara Cruises gives you the thrill of a lifetime! Tip: Lines are smaller at the start and end of the day. Have you checked any of these out? Let me know what you thought? Thank you to Niagara Parks. My family had an awesome time. When you travel with four beautiful girls... life is good!